What's the deal with Site Build It? As you will soon learn, Site Build It! or SBI! is a very valuable resource to have. Whether you are an experienced webmaster, or brand new to the web business, SBI! offers something for you. SBI! helps thousands of small business owners build a successful online business. Some already have their own small business and want a site to market it - SBI! is perfect for that person! With SBI!, you can easily create and market your website simply and quick using SBI! 's proven approach. You don't even need to know HTML (the basic markup language to build sites) to do it! From day one, your website is already ahead of the many small businesses that go this path, but do so in the wrong way. Site Build It! is the perfect way! ...if you think this is a Get-Rich-Quick scheme, think again. SBI! 's mascot isn't the tortoise for nothing! It takes time for traffic to generate, and for you to get a steady income form your site. If this is sounding like a sales pitch, it's NOT. I am just giving you access to tons and tons of knowledge about SBI! and how it will be a life-changer for you. Dreams CAN come true...with SBI! Are you tired of your day job? Do you want to work from home? With SBI!, you will sooner or later (hopefully sooner) be on the path to your dreams and goals. And even better, do it in a fun way!!! Because of SBI! 's simplicity, anybody can create the site of his dreams! The limits are endless! No prior knowledge is required as you learn it as you build your business, thanks to the handy Action Guide. When I first started, I knew nothing about the web business. Not even any HTML. I just knew for a fact I wanted to start a site about my favorite hobby, unicycling. I was going to learn HTML, and do it the hard, unnecessary way. But then, I stumbled across Site Build It! and fell in love. Right from the start, I knew I found a way to be successful at this. Who knows where I would be without SBI!. Site Build It! is for anyone with the desire to start a web business, share valuable information about anything online, or even quit your day job. If you have a passion for something, even as small as unicycling, you can build a profitable business online. It's possible! Like my English teacher always says, K.I.S.S., which means "Keep it simple, stupid." The truth is SBI! follows the K.I.S.S rule to a point. All the steps to create your new life are all in a resource called the Action Guide (AG with SBI!ers =D). Just follow the steps carefully, and you'll be guaranteed to have a well-visited site within the first year. You will learn a process that works, even if it seems too good to be true. 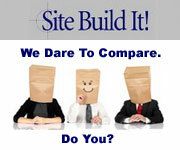 You will soon see (as your friends and family get jealous of your success) that Site Build It! is an easy (but does require dedicated work) solution to being successful online. Do yourself a favor, and purchase SBI!. Give it a try - after all, it 100% risk-free! You've got nothin' to lose! Order Site Build It! Now!